The author, Chris Khamis is a British Palestinian who has been active in the Palestinian solidarity and labour movements for many decades. Palestinians. It is 100 years since the Balfour Declaration, usually seen as the origin of the Israel/Palestine conflict, which said that the British Government “view with favour the establishment in Palestine of a national home for the Jewish people” thereby promising a land they didn’t own and where Jewish people were a small minority to the Zionist movement, supported at the time by a minority of Jewish people worldwide. It is also the 60th anniversary of the Six Day War when Israel occupied the West Bank and Gaza, Palestinian territories which remain under occupation to this day. At a personal level, this year is the 69th anniversary of the newly formed Israeli state telling my late father that he could not return from his studies in Britain to the town near Nazareth where he was born and brought up. refugees now number perhaps 7 million, many living in poverty in refugee camps. but for Jewish Israelis and for Jewish people around the world who still face antisemitism, have not been pleasant. Solving the conflict is not so simple. 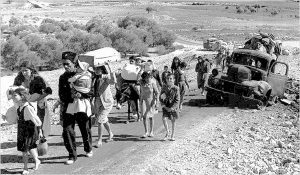 Israel’s continued building of settlements in the Occupied Territories and brutal treatment of Palestinians who live there is perhaps well known, less is written on the plight of Palestinian refugees, on discrimination faced by Palestinians who are Israeli citizens or the attempts at ethnic cleansing of Palestinians from Jerusalem. International institutions and the western powers occasionally issue condemnations but have singularly failed to stop the medieval siege of Gaza, the growth of settlements in the West Bank that is making the concept of a two-state solution a non-starter, the increasing discrimination against Palestinian Israeli citizens and the rising racism in the Israeli population. 1. Ends its occupation and colonization of all Arab lands and dismantles the Wall. 2. Recognizes the fundamental rights of the Arab-Palestinian citizens of Israel to full equality. 3. Respects, protects and promotes the rights of Palestinian refugees to return to their homes and properties as stipulated in UN Resolution 194. The Israel/Palestine conflict has gone on for too long. Too many people have died and too many continue to suffer. Britain has an historic responsibility to try and find a just, peaceful and sustainable solution based on human rights and democratic principles. We need to pressurise our government to live up to its responsibilities but we can also do something by supporting the BDS movement.